The West Tower Entrance is a tunnel in the Phendrana Drifts. The tunnel connects the Observatory to the West Tower. When Samus first travels through the room, there are two Scatter Bombus and two Crystallites in the tunnel. After collecting the Thermal Visor, the room will be darkened and the creatures will no longer appear. 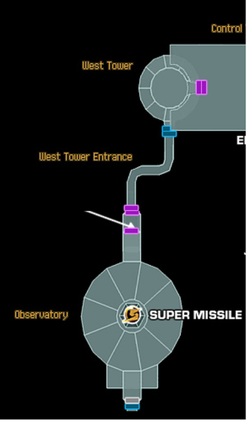 A Missile Shilld blocks the door to the West Tower, while a Purple Door leads back to the Observatory. This page was last edited on 16 June 2017, at 22:38.